Eight persons Elesh, Vikram, Vinay, Denny, Ela, Farukh, Gurpreet and Hitesh - are sitting around a circular table facing away from the centre. Each of them likes a novel of a different writer, viz Chetan Bhagat, William Faulkner, Charles Dickens, Leo Tolstoy, Mark Twain, George Eliot, Bob Mayor and Marcel Proust, but not necessarily in the same order. 5. 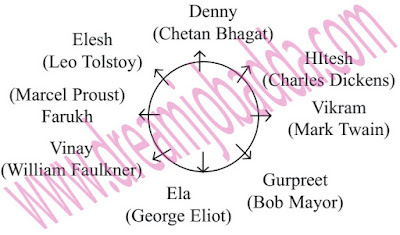 Denny is related to "Marcel Proust" and Gurpreet is related to Charles Dickens. 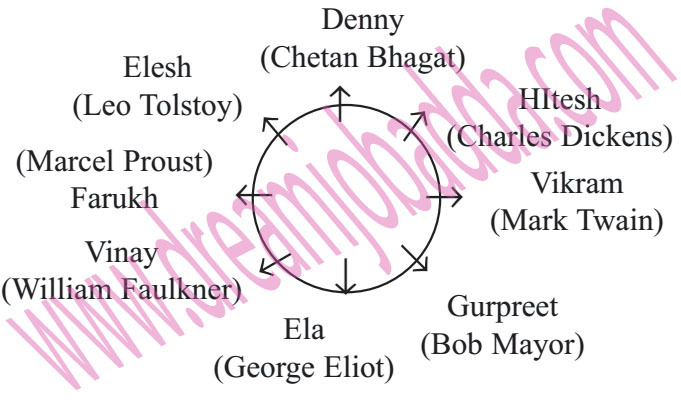 In the same way, Farukh is related to whom among the following? 6. Six friends M, T, S, R, U and W are sitting around a circular table facing the centre. What is the position of S with respect to M? I. M is between R and T.
II. R sits second to the left of W.
III. U does not sit on the immediate right of R.
7. What is the code for "cold" in a code language? I. "icecream is cold" is written as "tic jic lic". II. "fruits are healthy" is written as "mic fic eic". III. "healthy is icecream" is written as "jic mic lic". 8. Among P, Q, R, S, T, U, whose rank is first in a class test? I. P scored more than only R and S.
II. T's rank is 3rd highest. III. U did not score the highest marks. 9. Five persons Jitesh, Jeevan, Jeet, Jai and Jeena sit on a straight line, facing north, but not necessarily in the same order. How many persons sit between Jitesh and Jai? I. Jeet sits second to the right of Jitesh. Jai is not an immediate neighbour of Jitesh. II. Jeena sits on the extreme end of the line. III. Jeet sits on the immediate right of Jeevan. 10. How is N related to X? I. M is brother of N; M is grandson of W.
II. S is sister of N.
III. X is mother of M's father.